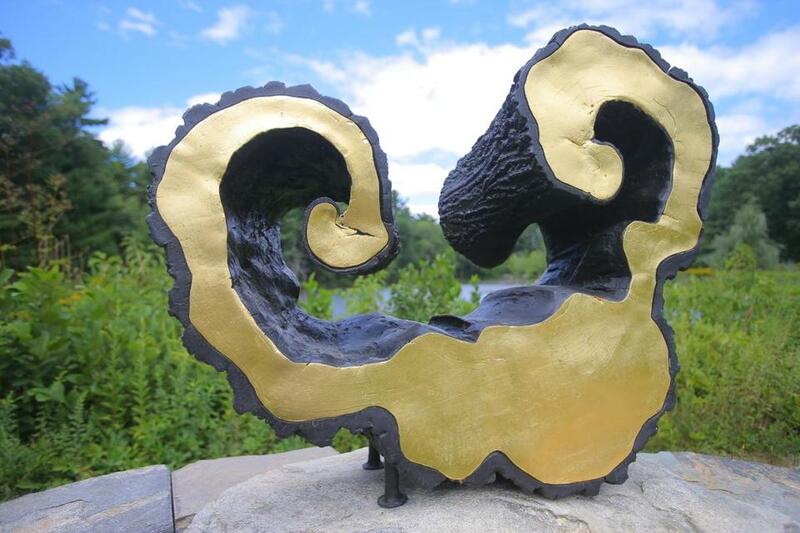 Lydian&apos;s Harp, a cast bronze by Linda Hoffman, will be on view at Old Frog Pond Farm & Studio in Harvard. HARVARD — The night before, rain had pounded Old Frog Pond Farm & Studio, soaking orchards and meadows and the roughly 14 acres of wooded paths lined with sculpture: circus animals in a clearing, tiny contemplative figures settled on rocks, a giant spider made from tree branches hanging on fishing net from the side of a shed. But in the morning, the wind, which had howled in the treetops all night, purred as sweetly as a kitten and a collection of heart-shaped discs that change color in the light, aptly named “A Jubilation of Heart,” floated quietly on the pond’s surface. In the nearby field, near the road and the sign announcing “Organic, Pick U Own, Raspberries, Peace,” a solitary ellipse made of wire and zip ties called “The Egg” greeted visitors to the raspberry patch. 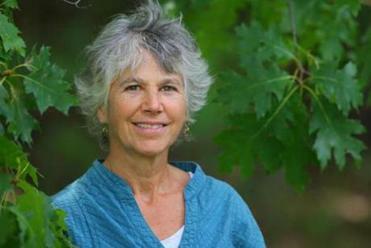 For the past decade, during a month-long event that celebrates agriculture, art, and community, Hoffman has been sharing what she gained by retreating to the woods: compassion for herself and all life, human and animal; a commitment to nourishing the soil where she grows organic fruit and vegetables; and a way of life focused on giving. “We care about healing the world, making a difference where we can, and this is what we can offer,” she says of the life she has built with her partner, Blase Provitola. The 10th annual “Around the Pond and Through the Woods” opens Sept. 3 with a self-directed walk through an outdoor collection of more than 20 sculptures made by local artists — including, in a newly made glade, Groton artist Paul Matisse’s “Olympic Bell,” a sculpture that graced the entrance to the Acropolis during the 2004 Olympic games in Greece. The exhibit will be open to the public on weekends, 11 a.m. to 5 p.m., with an entry fee of $7 per person or $20 for a family. There will be self-guided walks, a painting workshop, music, African drumming, and opportunities to pick organic raspberries and purchase other fruits and vegetables grown on the farm. You don’t need to know about art to appreciate the whimsical, reflective, and awe-inspiring sculptures included in the show. Nor is it necessary to be adept at identifying plants and birds to enjoy the walk. But expect to be charmed, puzzled, and inspired as you stroll the wide paths and take in the views. And there are stories everywhere: among the stone pillars of the medicine wheel made by Hoffman’s partner, Provitola; embodied in Hoffman’s tiny meditative, Zen figures; and in the world-famous Olympic Bell, made by Hoffman’s former husband and the father of her three children. During the next month, events at Old Frog Pond Farm will reinforce what Hoffman learned after moving to the farm. Trust the ground under your feet. Listen to the wind. Take comfort in the arms of the trees. On Sunday, Sept. 4, actor Stephen Collins will present “Unlaunch’d Voices: An Afternoon with Walt Whitman.” Later in the month, visitors are invited to a plein air poetry reading by Susan Edwards Richmond, live jazz by The Morningside Studio Jazz Band, African Drumming with Moussa Traore & Friends, and a watercolor workshop. In the clearing made for the Olympic Bell, shaded by majestic white pines that seem to touch the sky, Hoffman pulls the rope, and the bell, a hammer striking a tuned metal cylinder, exhales a sound that travels like a prayer. 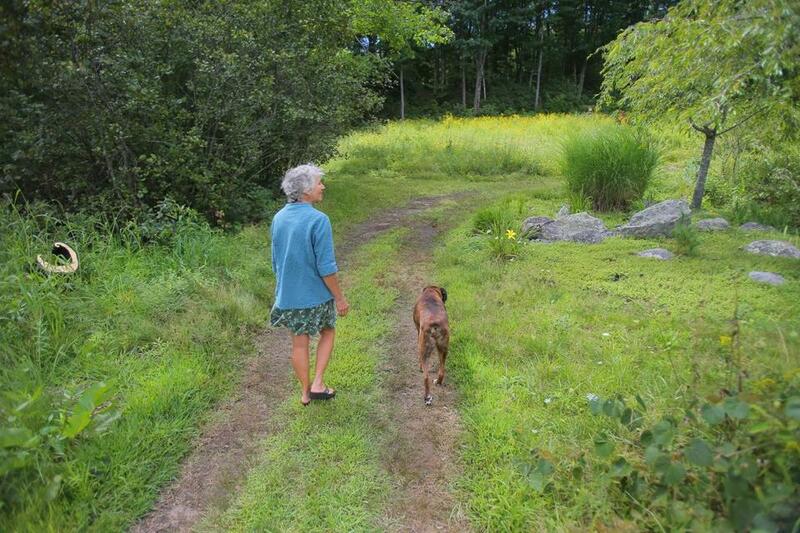 Linda Hoffman walks on the grounds of Old Frog Pond Farm & Studio.